Hawaii Volcanoes and Weddings happening here have received much media attention. With red lava flowing around a particular neighborhood on far east side of the Big Island Of Hawaii, the pictures are stunning and the TV news makes the eruptions appear much more serious than it is. The truth is just a tiny fraction of the Big Island is in trouble with some homes catching fire. Over the last few months since Kilauea woke up, one person has died. This is tragic to the family but threats to others remain extremely very minimal. With so many weddings and other tourism potentially threatened it’s important to deal with the facts and not dwell on media sensationalism. Hawaii is relatively young, geologically speaking. The oldest rocks above sea level are just less than one million years old. The Big Island of Hawaii was formed by 5 volcanoes, but only three are considered active: Hualālai, Mauna Loa and Kīlauea, all on the Big Island of Hawaii. 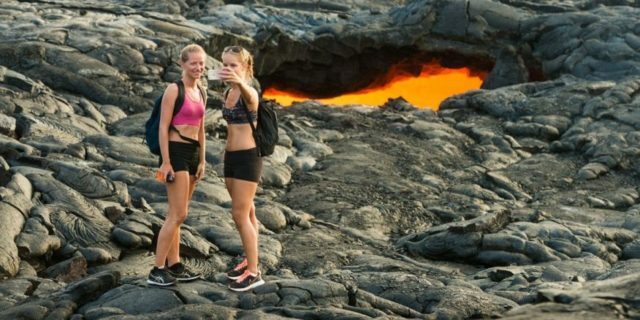 The Big Isalnd’s volcano is becoming quite the tourist attraction. Wedding couples and all can take helicopter tours over it and see the amazing views. There are also cruise ships that sail around the island with passengers getting a great view and experience. Where Are the Best Places to Get Married on Maui? Where Are the Best Places to Get Married on Maui? There are many locations and venues to select. Most couples want a beautiful beach setting, while some prefer a garden setting or a church. 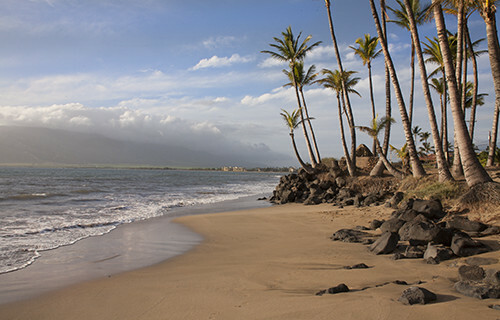 Maui’s beaches are renown for their beauty, simplicity, and romance. Looking out at the sunset while you say you vows to your soon-to-be husband or wife is a dream. At Hawaii Wedding and Vow renewal, we have planned over 8000 weddings (literally, since 1994). Almost everyone prefers a beach setting and we have our favorites. Another popular venue location is Wailea Beach in southwest Maui fronting the world-famous Waldorf Astoria Grand Wailea. Brides have all their salon services here at the best salon on the island ( mani, pedi, hair design and make up). They also have a changing room for the bride ( and bridesmaids if any) to use. Then simply walk outside and getting married on Wailea Beach. Sugar beach is also a favorite, especially for those stating in Lahaina, Kaanapali or Kapalua. The beaches in those areas are small and very crowded. See Sugar Beach here. There are so many nice beaches on Maui for your ceremony. If you have one in mind let us know. Some couples want to get married near their hotel or condo and that is a good option too, as long as the beach there is not too crowded. The last thing coupes want is a beach-going family just a few feet away making noise. 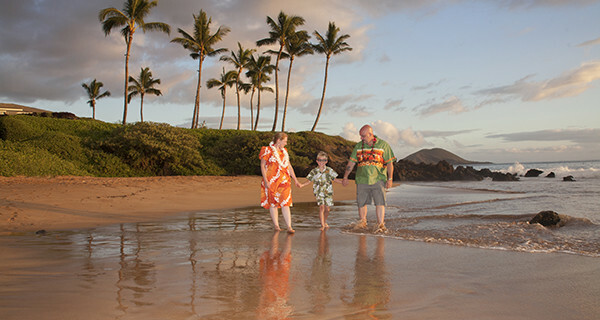 So, since we have done over 8000 weddings, we are very familiar with the best beaches on Maui. Want a church wedding? The best church on Maui we like is also located on the slopes of Haleakala. This is a historic church, and the ocean views for the photography after the ceremony are amazing. It is also so cute inside the church, you must see the pictures and video. See Maui’s best church here. The best places to get married on Maui, we know! Give us a call at 808-891-1208 or email us to discuss. Hawaii History and its impact on a Wedding in Hawaii is unknown by many wedding couples and many locals as well. A wedding in Hawaii is greatly different today than centuries ago. Although history has said that Captain James Cook discovered Hawaii in the 18th century, the Polynesians arrived over 1,500 years ago. Thus Cook did not discover Hawaii. He came with sailors who came upon an island chain already founded, with a legitimate monarchy government in place. The Hawaiians kept much of their Polynesian culture and adapted somewhat thereafter. The language evolved and some cultural aspects changed too. Over the last 200 years many races and ethnic groups immigrated to Hawaii. The Chinese were first to come after the Caucasians and were primarily field workers. Japanese, Filipino’s, and other groups followed them. Although Hawaiians had their own indigenous religion in place, Christian groups came and converted many of them to Christianity. Missionaries first came in 1820 from Boston. They became the first secondary settlers in Hawaii. The Hawaiians did not have a written language, only oral. Stories were passed down from generation to generation. Missionaries helped write the Hawaiian language. But, events evolved with the coming of the Americans. There is some controversy if the missionaries helped or tried to put a demise to Hawaiian religion practices. Many Hawaiians believe they negatively affected their life. Although some Hawaiians did convert to Christianity and gave up their beliefs, others did not. Hawaiians were encouraged to dress appropriately according to missionaries standards, and to stop their practices such as the hula, an ancient form of dance and worship, brought from Polynesia. Eventually, school polices came in place. The Hawaiian language was forbidden to be taught and students were not allowed to speak Hawaiian or else they would be punished. 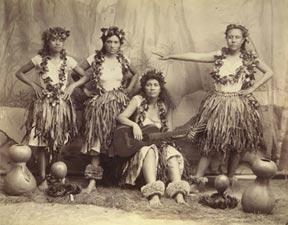 Hawaiians had to dance hula hidden from others otherwise there would also be punishment. In 1898, the sovereign nation of Hawaii was illegally overthrown by the United States government. The beloved Queen Liliuokalani was imprisoned in her own palace, never officially giving Hawaii to the USA. The overthrow of the government was began by American businessmen who wanted the US to take control for financial reasons. They conspired and convinced the US military that Hawaii was strategically important for the US to govern due to its unique location. Hawaii became the 50th state in 1959. In 1994 President Bill Clinton wrote a letter to the people of Hawaii officially apologizing for the illegal takeover of the sovereign nation of Hawaii. Many Hawaiian organizations are striving to attain sovereignty today. So we come to the discussion of weddings. Weddings changed. When a couple wanted to be married there was not a wedding ceremony. The couple would approach their Kumu (tribal leader) and ask if they could be together. The Kumu would say “yes” or “no” . (Most likely he would say yes) Then he would say “Go” and that’s it. There was no formal ceremony except for the Ali’i (royalty) and details of this are not exactly known. There was no Hawaiian wedding ceremony. The ceremonies we see today of a Hawaiian nature were adapted after Christianity and western marriage culture merged into Hawaii. See Hawaii wedding ceremony. We at Hawaii Wedding and Vow Renewal try to respect the Hawaiian culture, it’s people and their rights. We have planned and coordinated over 10,000 weddings since 1994 and are well known within the Maui community. 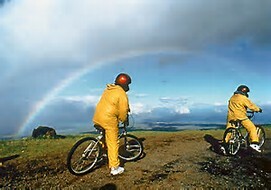 There are many Maui Activities to do for your honeymooon ( after your wedding or vow renewal) here. Maui activities do book up. To reserve now see our partner’s activity reservations and activity pricing . There is so much to so see on Maui which is probably why Expedia customers named Maui the best island world-wide! We are not just beaches. Our 10,00 foot volcano is a must see. You can drive and see awesome waterfalls, hike through bamboo forests, go on dinner cruises in the sea or experience a Hawaiian luau. Visit museums, see tropical gardens and botanical gardens, drive down awesome view roads with unbelievable views. There is too much to mention. The best Maui Activity (after your wedding) is probably enjoying the Maui beaches. So many news outlets have named Maui’s beaches the best, and folks that live on other Hawaiian islands always talk about Maui beaches being the best, acquiescing that although their beaches are great, Maui is the best. Our island population of 125,00 people compare to Oahu’s 750,00 population, you can see why our larger island will have a significantly less people on them. So, with Maui, you get that true tropical island experience and not an overcrowded feel. Southwest Maui beaches are the best. The surf is not as huge as the north shore so just about anyone, even the non-experienced ocean goer can jump right into the ocean and not be overwhelmed by large waves. There are some days when the surf is larger so do take a look before going into the water. This area includes Maalaea, Kihei, Wailea and Makena. There are many Maui Activity companies that offer services here: Surf lessons, fishing trips, snorkeling excursions, diving lessons and excursions. Whale watching is so popular with many people who come exclusively to whale watch as Maui is the island where there are best seen. 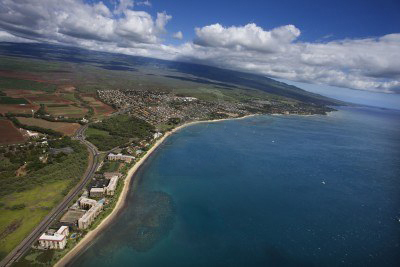 With 120 miles of coastline, Maui boasts over 303 miles of beautiful beaches. On these world famous beaches you’ll see white, \black and red sand beaches, with great \ surfing and windsurfing places as well as some of the best beaches in the world to simply swim, snorkel and sunbathe and even tap a nice soothing nap!. On our next story we will outline the best resorts of Maui. Call us now if you need to know, 808-891-1208. Hawaii Wedding and Vow Renewal has received 60 verified google reviews as of December 2017. We are thrilled with the 4.8 score. These reviews are from confirmed customers ( with full names and their email addresses ) over the last year. We do 500 weddings and vow renewals a year on average and have been in business for 24 years on Maui. We have done over 8000 weddings and vow renewal on Maui. They are wonderful. They took away the stress of planning a wedding, and made our process easy. The ceremony was exactly what we wanted and more. The location was perfect. Kevin was professional and added a wonderful sense of humor. He was easy to work with and made our wedding an occasion to remember. The flowers were gorgeous. The photographs were perfect. For planning a destination wedding, they are the place to go to for everything. They will make your wedding memorable. Thanks so much Jill. We really appreciate your thought-out review. Being in the wedding business on Maui for well over 20 years has taught us how to make it perfect, and for us to enjoy the experience as much as our customers. We had a truly wonderful experience with Kevin and Hawaii Wedding and Vow Renewal. With just a few phone calls and emails we were all set to make our dream of a special Hawaiian wedding come true. Kevin played the roles of both minister and photographer and did an outstanding job at both! He had our digital photos uploaded to Dropbox for us within 24 hours. Thank you to the entire team for making our visions visible and for making our dreams a reality! We are truly glad we chose Hawaii Wedding for our vow renewal ceremony. The whole process from booking to the ceremony itself was very smooth and they were very accommodating and helpful. The Hawaiian ceremony was beautiful and both my husband and I couldn’t hold back the tears. I’m also very happy we decided to go with the video and photo package. The video turned out absolutely amazing (thank you SO much Brian), in our case it was just the 2 of us on Maui and this way family could be a part of the moment too. We are truly grateful for Kevin, Kristina and Brian! They are warm caring people that made our special day come true just like we had imagined! THANK YOU!! A job well done! This was a renewal for us (10 year) but just as precious because we never had a “real” wedding. Everything was perfect. The Hawaiian ceremony was exactly what I wanted. The beach was beautiful and my pictures I will cherish forever. I was really touched by the ukulele player’s rendition of “Thinking Out Loud.” Perfect, perfect, perfect – professional and kind as well. Thanks for everything. Hawaii Weddings made our big day better than we imagined. They effectively eliminated typical wedding stresses. My husband and I didn’t fight over wedding preparations and were able to kick back, relax, become closer and enjoy the experience. As it should be when planning to join your life with another. The spot was beautiful, the Hawaiian ceremony was magical, and flower decor was lovely. We made the right choice with using this business that was so organized and attentive. We’ll remember that special day always and we look forward to vow renewals at the same spot with Hawaii Weddings. We celebrated 47 years of marriage with a beautiful Hawaiian spiritual service. What a wonderful experience, we were delayed from Australia but Kristina was able to transfer our ceremony to the next day. it was beautiful Gammy our celebrant made it so special it is a day Hans and I will treasure forever, we were lucky to have 7 of our 8 children also present. Maholo! 7 out of 8 Kids attending is amazing! We were honored to have been a part of celebrating 47 years of marriage, wow.! Mahalo Mahalos to you and your lucky family. We celebrated 25 years of marriage in a beautiful cove in Maui. Rev. Kevin made our day very special. I highly recommend Hawaii Wedding and Vow Renewal. They made the process easy. The photo shoot was simply amazing. STUNNING!!! Rev. Kevin was amazing. The ceremony, the location/beach, the sunset, the pictures…all perfect. Our 20th renewal ceremony was priceless. Thank you. We had a phenomenal ceremony!! It meant so much to be in Maui with all our friends to celebrate our 20th anniversary. The pictures we received were WONDERFUL! A memory we will never forget!! If you are looking for a stress free wedding experience in Hawaii, look no further. Hawaii weddings made our planning process virtually stress-free and everything we dreamed of plus more. They took care of every detail and customized our wedding to exactly what we wanted with ease. Kevin, Kristina and their team are professional, down to earth and honest people. Photography, music, location, hair/makeup appointments, flowers, etc. was flawless. We are so thrilled to say Hawaii weddings did a fantastic job!! Thanks so much. We sincerely appreciate your comments. Aloha to you all. The ceremony was everything we could have wanted it to be. Kevin was great. He was patient and kind and had a very warm personality. The location was perfect as well as the pictures. Mahalo for everything! Hawaii Weddings did an outstanding job taking care of our wedding needs. My wife and I renewed our vows in Maui and we couldn’t be happier with the service provided. The entire staff made the process from booking the ceremony to the ceremony itself very easy. They were accommodating and all we had to do was show up. We renewed our vows on the beach in Wailea with Kristina officiating the ceremony. Kristina made the ceremony, especially the Hawaiian flavor, feel very personal. It was the first time our boys had been to Hawaii and they still talk about what a great time they had and how much they enjoyed our vow renewal ceremony. My wife Leila and I would recommend Hawaii Wedding and Vow Renewal to anyone looking to have a personalized wedding experience. MAHALO Nui Loa! Beautiful vow renewal. It was barefoot and casual as we wanted, and we couldn’t have ordered a more perfect sunset. Having Tim on ukulele was an added bonus too. Tasteful and meaningful all around. Thanks so much. It was my pleasure . Many couples come to Maui to renew vows or get married and I love my “job” . Come again for your 30th! We renewed our vows (10 years) and had a simple ceremony on Baby Beach. It was very relaxed and turned out great. Very nice ceremony. Thank you! We had an exceptional experience with Hawaii Wedding!! They took very good care of us! Being from New York, they made the planning of this special event seamlessly and so very easy! They set up all the necessary appointments needed for the marriage license and couldn’t have possibly done anything else for our event to go well!! Everyone in the office was always very responsive to our questions and made us feel very well taken care of!! Rev Kevin is amazing!! We wouldn’t want anyone else to marry us! He has a very calming presence about himself and provided wonderful suggestions for us to capture our special day. Thank you so very much for making this event so very very memorable and special for us!! We contacted Hawaii Wedding from Germany by e-mail. All our questions were rapidly answered, anything went perfectly well. Kristina was our main organizer and she did an awesome job. She also was our officiate at our vow renewal and she made it a very special and exiting event for us. Po’olenalena Beach is a terrific spot. Sara as our photographer was fantastic, we had a good connection and the photos are fantastic, too. Thank you very very much! We’ll never forget! Thanks so much. We do over 600 weddings and vow renewals a year on Maui Hawww, and many international couples come here. as it is easy. Most countries recognize marriages from Hawaii and we are more than happy to communicate via email to ensure a perfect wedding. Please come again for your 5th or10th vow renewal,celebration in Paradise. Working with Hawaii Wedding was amazing! They made our wedding day a day to remember. The beach was picture perfect and the rose petal isle was just beautiful! The photos came out GREAT! As Rev Kevin said “Today set the tone for the rest of your marriage” and our wedding day thanks to Hawaii Wedding was PERFECT! Thanks so much Lauren. I am glad you are happy with your pictures. I love capturing the moment and with you guys that job was easy as you are full of love for each other. Come back some day! The ceremony was great and we couldn’t have asked for a better location for our wedding. It was nice to get the pictures quickly too so that we could send them along to friends and family. Everything met our expectations. Everyone at Hawaii Wedding was amazing! The booking and organizing process was simple and easy and our wedding went perfectly! They took care of everything and all we had to do was show up, it was wonderful! I can’t say enough good things, our wedding was perfect, I highly recommend Hawaii Wedding! Please come back for your 5th or 10th wedding anniversary for a romantic vow renewal ceremony at sunset on a secluded beach on Maui, ( NOTE: CNN just said yesterday that Maui has been selected as the world’s best island surpassing all the Greek Isles and Jamaica! Thank you for your comments. We do have couples and families of mixed faiths and this has been something we respect and try to accommodate. The beach you used has been our favorite for over 22 years now of coordinating weddings and we are sure you will treasure and remember your Maui wedding for the rest of your life. Thanks for much Lori. You are right, Sarentos is the best to go to after the ceremony. It’s our favorite restaurant on Maui. My wife and I renewed our vows on 6/23/16 and couldn’t be happier. It was great making your day perfect. We love doing this and are happy for you. We have coordinated over 7000 weddings and vow renewals since 1994 on Maui. A BIG Mahalo to you guys! Trash Your Wedding Dress. Some brides have fun after the wedding on the beach by trashing the wedding dress. We see so many posts now from around the country with images of women purposely getting their dress ruined somehow. 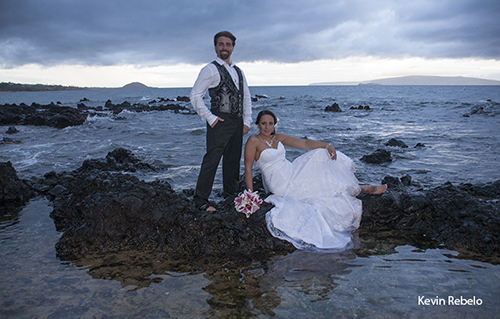 On Maui, the bride usually gets into the water and sand with a fun photo op. And yes, the dress can always be dry-cleaned and probably back to normal afterwards, maybe. But what about the men? You never hear about trashing the tux or suit. The men get right into the water and on the lava rocks and get their wedding attire ruined too, but perhaps it’s because the bride’s wedding dress is a “once in a lifetime” dress so it rises on the importance scale. We first saw Hollwood popularize the “Trash Your Wedding Dress” phenomena in the movie “Sunset Beach”. So, if you are getting married here in Hawaii, how do you do it? Poolenalena Beach, our favorite beach for weddings ( due to its beauty and more seclusion than most beaches) is probably the best. There are lava rocks to add the the photos uniqueness and to allow you to sit on it while a wave comes and splashes up all around you. Another favorite pose would be laying in the sand and waiting for that wave to come ( hopefully not a shark along with it, just joking) Be sure to select a professional photographer who knows how to shoot into the sun without getting a silhouette shot, and a pro who is able to maintain his/her camera dry! Hawaii Wedding, why have it here? Hawaii Wedding, a dream of many couples, yet still an unknown location to have one of the most important events in your life so far away from home. We have planned and coordinated over 8000 weddings and vow renewals on Maui since 1994, and we have heard and seen it all. A legitimate question we heave heard once in a while over the years from brides is “How can I plan a wedding from so far away?” OK, good question! We set up your marriage license appointment, send you directions and go over them with you. The license form is just one page long, no blood tests, just show photo ID and pay $70.00 and your appointment with the State License Agent is just 15 minutes long. After the wedding, we submit the paperwork to the State and the Hawaii Department of Vital Records mails you your marriage license about 3 -4 weeks after your Maui Wedding. The package you select with us includes everything you will need. Your Officiant is experienced and likable. We have various different ceremonies you can select or even customize and write you own vows! It’s up to you. You can have a Christian ceremony, a spiritual non-religious ceremony, a short and simple civil ceremony or the most popular is a Hawaiian ceremony. ( Some couples like to have the Hawaiian ceremony and close with a Christian prayer. ) We can totally do ceremonies from other faiths. After you select your wedding package, venue, and ceremony type, we do the rest and all you need to do is show up! Hawaii Wedding, why have it here? Expedia users named us best island world-wide in 2016. They are correct. Travel and Leisure Magazine named us best island world-wide. Conde Nest Travel magazine named us best island world-wide for 19 consecutive years. Where to Stay on Maui ? There is a reason for all these accolades. Beaches forever, waterfalls to hike and swim in the pools below, see museums and the world’s best art galleries, whale watching, sight seeing, winery tours, more hiking in bamboo forests, snorkeling our coral reefs, fishing, boat riding, oceanfront fine dining, reading a book in the shade at the beach, Living Aloha. The list is too long. A Hawaii Wedding is the best. So, if you need any more convincing, google us, read our verified reviews from past customers and email or call us at 1-808-891-1208 or toll free at 1-808-859-0072. We will see you in paradise. Maui, voted best island worlds wide for 19 years brings us much satisfaction here to us locals. Families comes from around the world to enjoy themselves. 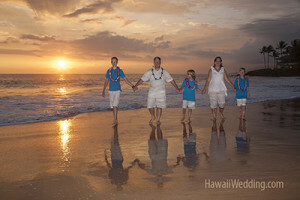 A popular activity is a Maui Vow Renewal and a family photoshoot after the CEREMONY. 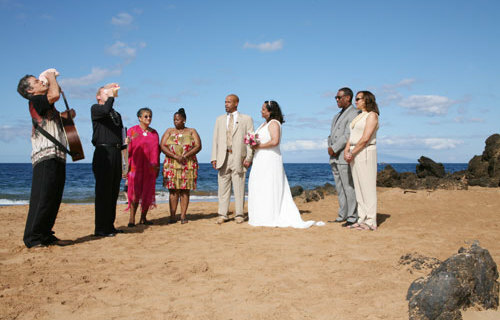 Vow renewals in Hawaii are great for the married couple to renew their love for one another on a secluded Maui beach. Saying ” I do” once again at sunset with family surrounding is an ultimate emotional experience. Click here for Maui Vow Renewals. Most couples then have a family photoshoot with a pro photographer shooting the kids, grandma and grandpa, and group shots; pictures to be treasured forever and passed down the generations. Renewing vows in Hawaii are done at our most popular beach, Poolenalena! Maui and Memories is what life is all about. Our memories are an important aspect to our well-being. Pictures that can be looked at years later bring warm memories back and bring the family closer. 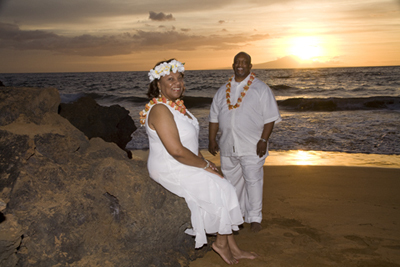 Renewing vows in Hawaii are the ultimate challenge to ones marriage and the renewal of the on-going wedding process. It unites us, strengthens us, and makes couples “one” once again. Try saying “I do” again and remember forever. Renewing vows in Hawaii has become a popular activity for many couples, especially those with families. A family photoshoot occurs after the ceremony and photos are treasured for lifetime. Maui’s awesome sunsets make memories that are so cherished. How many couples on a cloudy day back home look at the pictures years from now and are grateful for the life event? We get so many thank you letters form couples, too many to publish. Maui, voted best island world-wide for 19 years. No other island can come close to boasting this poll of travel magazine readers. So many people like that Maui Hawaii is A USA state, and they don’t have to deal with visa, money issues, safety concerns, etc. Come to Maui, Renew your life! Maui named #1 island world-wide. Expedia made there note-worthy news taken by votes from users. The reasons are numerous. Maui has the best beaches in the world; miles and miles of white sandy beaches highlighted with swaying palm trees and jutting black lava rocks from our volcano ( I’ll get to that shortly.) A Maui, Hawaii wedding on a secluded beach is the best. Our beaches are clean, not rocky, and you can stroll forever and relax and get exercise too. The nice part of Maui beaches is that they slope slowly into the water, so you can wade out and not all of a sudden be in deep water. Everyone, even the locals notice how clean Hawaii’s ocean appears. You can see all the way to your feet! This author remembers the last time I went into the Atlantic off of Florida and I could only see a few inches down, hmmm. Swimming on Maui? You bet! The south and west shores have waves that are minimal and its easy to swim and enjoy. Everyone knows about our world class surfing too. For beginners there are classes to take for all ages and even the most uncoordinated person will get up a a board and come to shore. The instructors practically guarantee it. Don’t let the idea of snorkeling scare you. It is so easy to learn in calm waters, and the colorful fish and corals you will see will amaze you. Snorkel gear is very inexpensive to rent here. Maui named #1 island world-wide is no accident. The gorgeous, gallant and loving whales come by the thousands to the shores off Maui every November – May. ( January-March is the best time to come to see them) Once, when whaling was legal, Hawaii had a sad history of killing whales. That ended decades ago and the whales are returning in greater numbers ever year. Even the old-timers watch in amazement as the baby breach (become born) and jump out of the water in glee. Just go to U-tube and watch a video of this. You will want to see it personally, and we have many boating and tour companies that have pro guides to take you out and explain the migration and living whales of Maui. Maui is not just about the ocean and beaches. We have Haleakala. It is our magnificent 10,ooo foot dormant volcano ( not extinct) that rises to the heavens with the most amazing views. Yu can drive yourself up ( Most people rent care here) or take a tour bus to the top and see a volcano lake dried up that looks like the planet Mars. There is also our waterfalls and bamboo forests to see. Later stories about this magnificent island to get married and honeymoon. Maui – best island word-wide! See our Hawaii wedding locations. Having a Maui Wedding Video is becoming more popular for a Maui Wedding destination. Since some family members and friends can’t attend your wedding in Hawaii, having a video of the wedding that can be shared back home is big plus. A professional video of the ceremony with couples “miked” properly so one can hear the vows being said is what everyone wants. The video can be played back at a reception later and of course listened to for years. Many couples pass the video on the to kids as a nice memory. See a snippet of a Maui Wedding Video here at https://www.youtube.com/watch?v=6O6JfJ4Xh3Q At hawaiiwedding.com we offer the best videographers anywhere. They shoot the ceremony and then after the ceremony they do nice out-take shots of the family and friends, and then focus on shooting the couple doing fun romantic “stuff ” on the beach during the sunset. Romance is captured on video for a lifetime. A Maui Wedding Video is more affordable then people think. The Hawaii Wedding package #4 includes a professional videographer, a pro photographer, an officiate and wedding planner, leis, beach permit, submission of legal documents to the State of Hawaii, all for under $1800. This is much less than folks pay back home, and of course Maui is the best place to honeymoon so this is a win-win situation. No one has ever contacted us that they did not like their video, and we have done hundreds of videos over the last 20 years in business on Maui. Wedding couples frequently ask us what is the best colors to wear for a video. Adding in blues, reds, greens to the wear gives a good contrast to the traditional white wedding dress and having a tropical colorful bouquet with flowers from Hawaii really “pops” in the video. If it’s a summer wedding we recommend lightweight clothing as it can be warm. So, consider adding a memory to last forever. Having a Wedding in Hawaii has become very popular, having now surpassed Las Vegas as the #1 wedding destination. The reason is obvious; romantic, authentic sunset beach weddings versus a strip gambling area with tacky chapels on every corner. It’s easy Having a Wedding in Hawaii. There is no waiting period. You can obtain your marriage license and get married the same day if you wish, although most couples get married on the next day. Hawaii also requires no blood test, so the license appointment with the Agent is only 15 minutes long and the application is just one page. See Hawaii wedding marriage requirements. Hawaii Wedding has operated over 24 years and has coordinated over 8000 weddings and vow renewals on Maui Island. Why Maui? Maui has been voted best island world wide by readers of Conde Nest travel Magazine and is the top choice of visitors to Hawaii. With long stretches of white sand beaches, waterfalls galore, and our 10,000 foot volcano ( which is a must-see) Maui is the island to visit. So, if you are thinking of Having a Wedding in Hawaii, select the most recommended island. People come back many times over their lifetime as it is so beautiful and tranquil here, the island of romance does exist. Most couples actually can save money by having a wedding in Hawaii as it is very affordable. Most major airlines fly direct to Maui. Our airport code is OGG in case you are using Expedia or Travelocity to get your air, hotel and car. Most everyone does rent a car as we are rural and it is easy to get around. The airport has all the major car rental companies. We recommend staying in the southwest part of the island ( The Kihei/Wailea area) as this is more upscale, the beaches are wider and nicer, and you are close to all the restaurants and activities. The Maui airport is just a 25 minute drive. The southwest part of Maui also has the least amount of rain, only 9 inches a year, better beaches, and it is most likely be warm and sunny every day. So, come to paradise! Scootering their way into marriage, that’s what this actual wedding couple did on Maui,There’s more than one way to say “I do” and this Maui ceremony couple decided to be unique. The event took place in the historic whaling village of Lahaina, Maui. The couple went “casual” Maui-stle enjoying our year-round warm weather. Mixing romance and a Segway ( green energy scooters) this ride of romance will be a fun long-lasting memory. This couple decided to take a fun picture and and had fun Scootering their way into marriage. Hawaii Wedding was pleased to coordinate their wedding. Many couples come to Maui for a corporate event, and decide to also get married and honeymoon since the boss paid for the conventions trip. Why not? Maui, voted best island for 19 consecutive years is one the most beautiful places on the world. 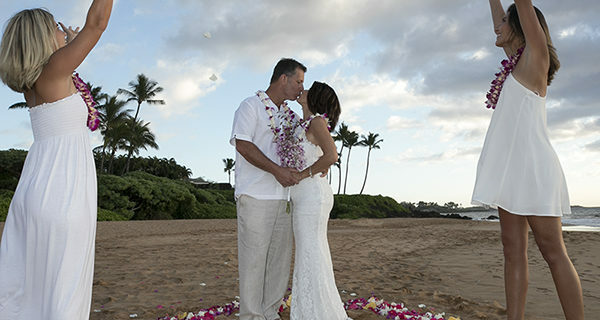 Couples have forever lasting memories of Maui, and so many come back for their 5th or 25th anniversary and have a vow renewal ceremony with us. They bring the kids and have group photos taken by a pro after the ceremony, See our view renewal page at Maui vow renewal. You don’t have to scooter your way into marriage. We have had couples get married on a kayak, ship, in the ocean….. whatever is your dream. Most couples have their Hawaii Wedding on the beach at sunset. This is the most romantic time to do it, and with so many oceanview restaurants right near the beach we use to go to afterwards, it makes the day perfect. Some couples choose maoeoings to capture the best lighting for photography. So, whether you are on a Segway corporate event or just on your own, Maui weddings are the best! For couples asking where to stay on Maui we offer these suggestions: There are so many Maui Hotels and apartments to select here on Maui. The best part of our island is the southwest side, in the small towns of Wailea and Kihei. Here you will find the nicest beaches. There are wide stretches of beach to go for long walks, taking in the scenery and people watching. Maui is so much more than gorgeous beaches though. Many of the islands best restaurants are located in this part of the island. Maui has been voted best island world wide for good reason. There are so many must- see’s. our 10,000 foot volcano is not talked about much but it is awe inspiring to stand on a former Lave lake bed and see forever into the horizon. You can hike around and take it all in. More next time friends . Maui Wedding Favors SweetCBake Shop, Hilo Hattie and Ben Franklin Crafts at the Queen Kaahumanu Center in Kahului Maui are some of our favorite places to get Maui Wedding Favors. There you can find Maui scented candles, shells, mini hula implements etc. Let you imagination run wild. Everyone likes candy, well most everyone. 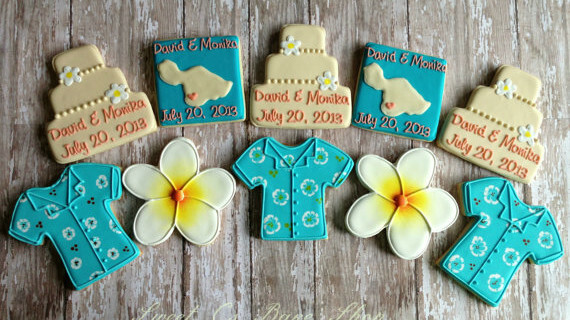 What better Maui Wedding Favors than these cool looking cookies from Maui. The Hawaiian shirt cookie looks like something you could wear and keep forever, but those of us who are sweet addicts may have a hard time doing so. It is traditional in the USA mainland and Hawaii as well to provide a gift or favor to guests. The favors need not be expensive but something unique is far better than the traditional favor. Make is something can talk about, enjoy, and savor. The cookies seem to be everyone’s favs, and they look cool at each place setting which adds a touch of gratitude on behalf of the bride and groom.The kids ( age 3 to age 93) have fun eating them, and are to be treasured. The tradition of giving wedding favors is a very old one. The first wedding favor ever that we know of was known as a bonbonnieret. They were treats full of sugar which symbolizes health and happiness. So your Maui Wedding Favors will continue this tradition (and more so) because they probably taste better than the pure sugar treats from thousands of years ago. Many brides have fun and “google” the term Maui Wedding Favors and can peruse the variety of gifts you can surprise your Hawaii Wedding guests. Make sure it is something you can pick up here on Maui and not have to ship it from home. You will avoid an unnecessary expense this way. Have fun on Maui and Enjoy!